Man, The Image of God: Can An Icon Be Iconoclastic? This month lets consider what it means to be made in the image of God, an important but controversial topic about which Christians differ greatly in understanding. Grasping its truth will help you see both yourself and others more like God does. The particular English word, “icon,” means “a picture, image, or other representation; a representation of some sacred personage, as Christ or a saint or angel, painted usually on a wood surface and venerated itself as sacred; a sign or representation that stands for its object by virtue of a resemblance or analogy to it; a person or thing that is revered or idolized.” The Greek word for “image” is eikon. Today, the last definition is most prevalent—a famous person or object. For example, “Babe Ruth is baseball’s best known icon” or “Ferris Buehler’s Day Off is an iconic movie.” Okay, you know God has already awarded you with the standing as a “saint,” a holy one, and because of that you can color in a sterling portrait of your life in Christ by walking with him one day at a time. In the sight of God, you can be an iconic believer! But what if an icon becomes iconoclastic? Whazzat funny word mean? “Attacking or ignoring cherished beliefs and long held traditions, etc., as being based on error, superstition, or lack of creativity.” Actually, the way you can become a spiritual icon is to stand for God’s Truth and debunk (which I guess means to kick out of bed) such erroneous so-called “Christian” traditions as the Trinity, God is in control, dead people are alive, speaking in tongues is a gift, etc., etc. That’s because God has designed you to be the image of Christ in a dying world, whereby you show the world His love and truth. 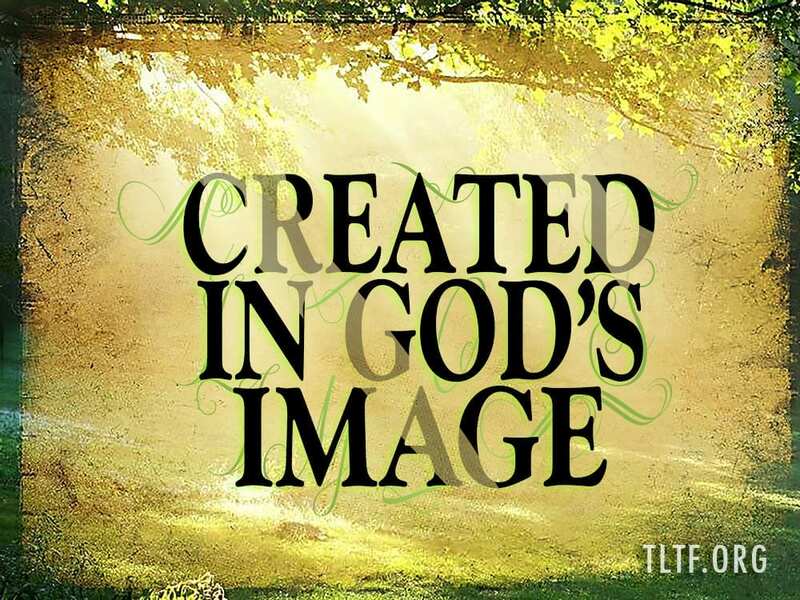 Note that both the man and the woman were created in the image of God. That shows us, as Scripture vividly confirms, that God Himself manifests the best of both male (fatherly) and female (motherly) qualities. It is as if God put man between Himself and the animals, giving him some characteristics of each. Physiologically and anatomically man is an animal, even sharing the genetic code [and invisible life force—ruach] with them (Eccles. 3:18-21). The Genesis account recognizes important similarities between man and the animals. Both were formed out of the dust of the ground (2:7, 19) and both are “living beings” (nephesh—1:20, 2:7). Along with that I was told that Adam and Eve “died spiritually,” but I don’t see that in the Word either. God told them they were going to die, which means physically, but that didn’t happen for a lo-o-n-n-g-g time. Why not? Because He intervened in Genesis 3:21 by making a “covering” of animal skins as a temporary atonement for their sin, so that they could live as long as they did. Of course that first shedding of animal blood pointed to the coming Redeemer whose innocent blood would be shed to cover humanity. There is no question that Adam’s disobedience severed the connection he had with God and ruined his loving fellowship with his Creator (to the degree that he hid from God), so that is how we choose to say it. What else is NOT the image of God in man? It is not one’s physical body. It is not unconditional immortality or having an “eternal soul” or being “spirit beings,” and our ability to fellowship with our Creator is certainly not a model of the communication going on among the three members of the Trinity, one of who will apparently be standing forever because there are only two seats on the final throne in Revelation 22. In considering what is “the image of God,” JESUS comes to mind first. 2 Corinthians 4:4 and Colossians 1:15 both state that truth. Because words have definitive meanings, one thing we know is that if Jesus is the image of God, he cannot therefore also be God Himself. The chocolate image of a bunny does not jump off your dessert plate. In John 1:1, God describes Himself as the Logos (the Word), i.e., the sum total of all His thoughts expressed in words to His created ones. Now here’s a huge theological statement with scads of doctrinal implications: GOD IS LOVE. By definition, love must comm-uni-cate with the goal of becoming one with. In that vein, JESUS, the Living Word, is God’s ultimate communication to sinful man. God made people to love and be loved by, and language provides the “bridge” between God and man and between man and woman (that is, if we males can figure out what them females is talking about). It seems clear in the Word that man’s phenomenal ability to learn and use language, and thus reason, is the chief aspect of his being created in the image of God. Therefore man is a sentient being, i.e., we are conscious and able to perceive what’s going on around us—and in us. What are some other aspects of man bearing God’s image? We have the ability to love with God’s love, to choose righteousness and holiness, and we can extend to people grace, mercy, and justice. In one sense, each of us is a little creator; we can originate ideas, inventions, works of art, etc. We also have genuine free will, and we can choose to be selfless and sacrifice our will for God’s will. We should note that such freedom is different than independence, which is more self-oriented. You and I are free to choose to serve our Father/Creator. As Bob Dylan once sang, “Ya gotta serve somebody.” Why not work for—and with—The Man who died to save you? For this reason, it really shouldn’t surprise us that we also have [the potential to be spiritually aware]…and [we can know] how we can be forgiven for our mistakes. And even though we live in the same environment as other creatures, we alone seem to find ourselves questioning how an environment as magnificent as this could exist without a Creator (Rom. 1:19-20). We seem to be uniquely curious about our origin, purpose, and meaning, and unlike other animals, we [can enjoy] a relationship with the Creator of the universe. This [ability] to commune with God is unique to the human species. Here are a few other pertinent verses about the image of God and the image of His Son, the first of which is God’s basis for prescribing the death penalty so that wicked people and their dastardly deeds are eliminated. One day, all of them will be gone—forever. Hooray! And just as we have borne the image of the earthly man, so shall we bear the image of the heavenly man. Those verses show that God, via Christ, has given each of us the gift of holy spirit, by which we have the potential to show the world the loving heart of our Lord Jesus. We need not be dominated by “the sin that dwells in us,” but rather, as we focus on living in the moment with our Lord, we can put on the mind of Christ and be like him. And—we have his assurance that one day we will be made forever perfect in his likeness. I’m sure that people who know me well can’t wait for that day! Because everyone who adheres to Romans 10:9 is at that moment filled by the Lord Jesus with God’s gift of holy spirit (Acts 2:32-33), I do believe that is the connection Adam lost. God is “holy, holy, holy” and God is “spirit,” so the gift of holy spirit that we now have is His divine nature (2 Pet. 1:4), and that gives us the potential to manifest the fruit of the spirit, which show the heart of God, like Jesus did. In other words, we live from the INSIDE OUT as “ambassadors” for Christ (2 Cor. 5:20) by choosing to think, speak, and act like our Lord. Yes, Paradise is most definitely lost, but anyone who so desires can clearly see countless evidences of The Creator all over the earth. In our book, Don’t Blame God, we say that God’s Creation is like the Mona Lisa stained by raspberry juice. Man in his fallen state is a mess, but unless one has totally sold out to evil, he can still choose to be loving, kind, gracious—at least when he is handed a puppy. As I look at people, I think of the saying, “Ya gotta love ‘em!” Seeing them as bearing even the badly blurred the image of God helps me do that. How do we learn to trust God and the Lord Jesus—or anyone? We must hang out with them and give them opportunities to prove themselves trustworthy. Spend quiet time with the Lord, listen, and then step off the spot you are on—just GO. We each have only one life to live. Let’s get out there and intentionally let people see the heart of God and Christ in us. Those who truly want truth will love what we can tell them about our precious Savior.